The Ex-San Diego Padre Chicken Still Rules!! ANAHEIM — The Anaheim Arsenal didn’t pull the only laugher at the Anaheim Convention Center on Monday afternoon. 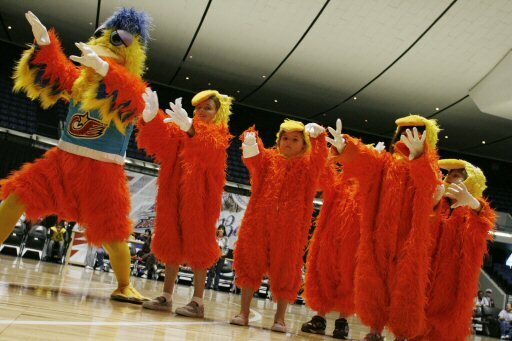 Accompanying their NBA Development League’s 113-87 victory over Fort Wayne was the Famous Chicken, also known as the San Diego Chicken. It was his first appearance in Anaheim since 1994, when the then-Disney-owned Angels told him he wasn’t needed anymore. Ted Giannoulas first donned the familiar yellow and orange chicken suit, with the blue shirt and blue plume atop his head, in 1974 while promoting a San Diego radio station. That was 34 years ago, and he hasn’t missed a beat. The Chicken was greeted with cheers when he made his initial appearance midway through the first quarter of Monday’s contest. His strut-to-the-music walk took him to Fort Wayne’s end of the court, where the team was in a huddle. The Chicken pointed his hands and wiggled his fingers as if hexing the visiting team. He ended that routine with a one-legged salute to the Mad Ants, similar to what a dog would do to a tree. During the course of the afternoon, the Chicken lost a dance contest to Barney — the dinosaur, not Rubble — and beat him up as a result. He later tried bribing one of the referees, dropping dollar bills on the court while wearing a trench coat, fake glasses and a mustache. The Chicken also pulled down the pants of a Fort Wayne assistant coach at the end of the third quarter, only to have his own clothes torn off by the coach at midcourt. 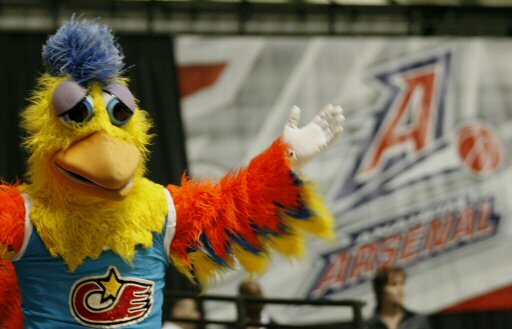 The assistant coach turned out to be one of the Chicken’s assistants and was chased out of the arena by the Chicken, who was left wearing nothing but yellow tights. When he wasn’t on the court, the Chicken mingled with fans, threw high-fives, kissed hands, clamped his beak around kids’ heads and stopped to shine the head of one balding spectator. While the Chicken’s appearance did raise the Arsenal’s attendance by about 400 fans, to 1,385, the arena was still pretty empty. Giannoulas was hoping for a bigger turnout, but that didn’t stop his effort to make people laugh. Giannoulas has been asked to perform for amateurs, All-Stars, Hall of Famers and even U.S. Presidents. He comes armed with a few scripted routines but is quick to ad-lib and make adjustments as they’re needed. The laughs haven’t been forgotten, nor have they stopped.